Rat runs – a shortcut to the future? Most neighbourhoods have one: that residential street that somehow has become a convenient shortcut for commuters, a bypass for a busy junction. Councils, after residents’ complaints, sometimes act by installing speedbumps. Subsequently residents complain about the “bump-scrape” as cars hit the ramp. The installation of speedbumps does not deter motorists from using a rat run. In some cases, councils block the road altogether. The closing of Barrack Street, a rat run between Grosvenor Road and Divis Street in Belfast prompted me to contemplate the wider picture. Belfast is massively car-orientated, more so than any other city in the UK. In a nutshell, we are still dealing with the consequence of 1960s car-centred politics, for instance the Benson Report recommended closing all but the Dublin-Belfast railway line and the commuter line to Bangor. Another example is the Jetsons-esque and grotesque Belfast Urban Motorway Plan, that appears to live on in the minds of Regional Development civil servants. The legacy of the Troubles was chronic underinvestment in public transport. All these have left Belfast more car-dependent than other similar-sized UK cities. The Department of Regional Development for Northern Ireland uses design guides for new road design, which in their introduction restate the dominance of car-based transport now and for the foreseeable future. It would be better were they to start with the mindset of the pedestrian. After all, we are all pedestrians. But that is a blog for another day. The NIGreenways blog asks what can be done to promote cycling in Belfast. We are not going to get Dutch-style separation of traffic flows without major investment and political leadership. Suggested are 13 ways to promote cycling in 2013. Boris Johnson, Mayor of London, has launched a £1bln cycling scheme for London. That may seem a lot of money, but consider this: the NI Executive is prepared to blow a similar amount of money on one road, the A5. Taking into account the population size, the A5 is a far more expensive plan, with far less economic benefit than Johnson’s grand cycling plan. Sustrans have long campaigned for safe routes to school and liveable neighbourhoods. Can Belfast address all these issues on the cheap? And do it well, so it serves local communities and keep traffic flowing? It has to be cheap because DRD prefer spending all of the road budget on large headline-grabbing car infrastructure. Neighbourhood residential streets have numerous driveways and junctions with limited visibility. The streets are meant for access to properties. Also, they provide a space for social interaction between neighbours; a place for children to play. Once through-traffic starts using a neighbourhood street the people retreat from it, because of the perceived and real danger of cars at 30mph driving past. Walking and cycling are discouraged by the volume and speed of traffic. In addition there is added road noise, made worse if speedbumps are introduced: the “bump-scrape” mentioned above, and the noise of cars accelerating to 30mph, only to slow down again for the next bump. And are they a short-cut in distance travelled? Do they save time? My observations (not scientifically proven) suggest they don’t. If a car leaves a batch of traffic on a main road and follows a rat run, they rejoin the same batch of traffic further on. The motorist’s advantage taking the rat run is taken away where they need to rejoin the main traffic flow. Often, lengthy queues build up on side streets where the rat run ends. A special circle of hell is reserved for the makers of SatNav systems and Google Maps. Choose the shortest route option and you will often be directed down neighbourhood streets, unsuited to through-traffic. I mentioned that Barrack Street has been closed off, after ramps failed to deter rats running. Closing the street forced traffic back to the main road at College Square East, designed for large traffic flows. 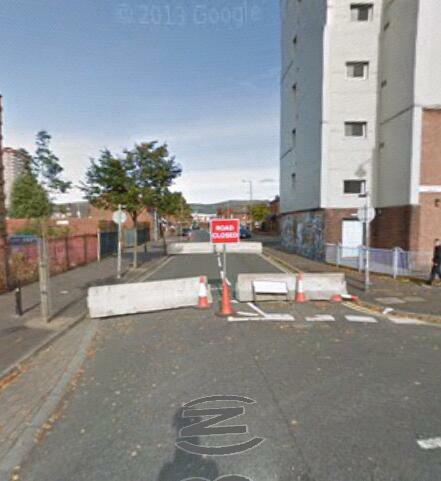 Barrack Street Barricade – not particularly attractive. Let me illustrate with a couple of South Belfast examples. I apologise for these “posh” rat runs. For almost all of the past 21 years I’ve lived in South Belfast. I’m familiar with its streets and know many of its residents. Strangford Avenue is a tree-lined quiet residential street where well-to-do residents own and have built large properties. It is slap-bang in the middle of the desirable BT9 postcode. You cannot get a more des res. Until the morning rush hour. Belfast city centre-bound rats leave the House of Sport roundabout at Dorchester Park, turn left down Malone Hill Park and then choose either to go straight across up Shrewsbury Park to join Balmoral Avenue, or turn left down Strangford Avenue, and turn right at one of the Harbertons (Drive, Avenue or Park) and rejoin Balmoral Avenue further down the queue of traffic. If traffic starts building up on the Malone Road, rats also turn left at Rosemary Park, Malone Hill Park and Mount Eden Park. Speedbumps have been installed to stem the flow of through traffic throughout the neighbourhood. 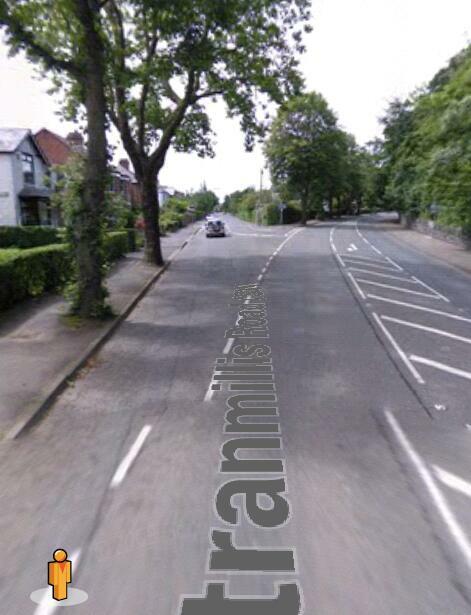 In 2012 a sewage mains replacement necessitated closing off Strangford Avenue at the junction with Malone Hill Park. For four blissful weeks my wife and I cycled along the tree-lined avenues in near silence. Simply closing Strangford Avenue pushed the rats back out to the main route along the Malone Road and Balmoral Avenue. Closing off the road meant fewer chose to go down Dorchester Park, and there were no queues at the end of Harberton Park. Some rats still persisted by choosing to use the Shrewsbury Park exit, but numbers were far fewer. A further measure to deter rats could be making Shrewsbury Park one way flowing from Balmoral Avenue to the junction with Malone Hill Park, so rats are forced back up Mount Eden Park towards the Malone Road. As my wife and I cycled along chatting we remarked how good it would be if it was like this all the time. For once we could cycle and chat without trying to make ourselves heard over road noise. The big question is, would Strangford Avenue residents put up with the inconvenience of living in a cul-de-sac, and a longer driving distance to the Malone Road, in return for a quiet morning? Strangford Avenue is quiet in the evenings. Rats see little benefit waiting to cross west-bound traffic down Balmoral Avenue to enter the maze. Knightsbridge Park is different. Whatever the time of day, whatever the day of the week, rats will use this run to bypass the traffic lights at the Stranmillis Road junction with the Malone Road. If you travel city-bound on Malone Road past the Newforge Lane junction you see people filtering into the lefthand lane. Why? There is a queue of rats in the righthand lane waiting to enter the run at Deramore Drive and further down at Bladon Drive. Traffic from Deramore Drive joins Bladon Drive, then turns left onto Knightsbridge Park. Coming from the Stranmillis Road roundabout a lot of traffic goes straight up Richmond Park, leading to Knightsbridge Park, rather than veering right along Stranmillis Road. The road lay-out encourages rats to enter the run. There is a good reason people might go here. Stranmillis Primary School is halfway down the run and many parents drop their children off and pick them up again at the school gate. The roadworks at Strangford Avenue pointed out where the rat run could be closed off permanently. Where can Knightsbridge Park be blocked off? People still need access to the school. At the bottom of Bladon Drive there is a T-junction. Knightsbridge Park is to the left. To the right is a small cul-de-sac, Bladon Court. The connection between Bladon Drive and Knightsbridge Park could be severed. This option would not allow access to the school from the Malone Road. Not ideal. 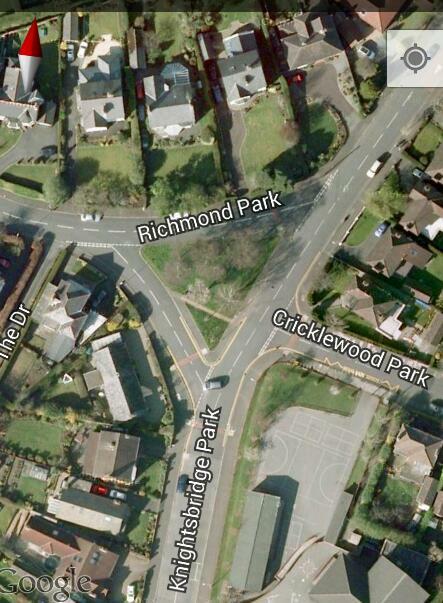 The second option is closing off or reshaping the lower junction of Stranmillis Road and Richmond Park, pictured above. This might cut back Malone Road-bound traffic. Because this is a two-way rat run, however, Stranmillis-bound traffic would start using the more dangerous upper junction. Not a real solution either. Stranmillis Primary School occupies a cramped site on the corner of Knightsbridge Park and Cricklewood Park. The crescent of Richmond Park completes a triangular space. What if Knightsbridge Park was closed off completely at the school, allowing only pedestrians and cyclists through? And if the school was allowed to claim some of this space? The aim of closing rat runs is to stop through-traffic from using unsuitable neighbourhood streets, but more than that, also to reclaim streets for social interaction between neighbours, for children playing, for walking the dog. A school, such as Stranmillis Primary School, is at the heart of neighbourhood life. Parents gather at the school gate, meet and chat. Let’s imagine a space where this social interaction can happen; a soft-surface play area, bounded by some planters and benches, perhaps. And what better place to put this, than at the school gates? No longer need pupils fear cars rushing past outside their school. Hillside Court, opposite the school, can be dead-ended for cars: there is an alternative access from Stranmillis Road to this street at Broomhill Park. Closing off the run would lead to a greatly improved traffic flow on the Malone Road, when rats no longer block the city-bound overtaking lane to turn right down Deramore Drive or Bladon Drive. In the two examples above we have closed off, boldly, two well-known South Belfast rat runs. Cars are now only entering the neighbourhoods for access to properties, to drop children off at the school, and we have forced through-traffic back onto the main roads where it belongs. The streets fall quiet at rush hour, children come out to play and the sun dapples the leaves of the trees lining the avenues. Belfast is failing to implement a coherent network of cycle lanes. Advisory cycle lanes are really parking lay-bys; bus lanes are bus and taxi lanes (also here) and Belfast on the Move pretty much ignores cycling as a serious means of transport, relegating the interests of cyclists below car parking and the interests of the partially-sighted. But now we have quiet streets in two neighbourhoods. And with some more imaginitive blocking we can close off a few more rat runs: Orpen Park, Diamond Gardens and Grangeville Gardens (all in Finaghy), Church Avenue (Dunmurry), Trossachs Drive (Upper Malone). East of the Lagan there are two notable rat runs ripe for blocking: Ravenhill Park and Cherryville Street/My Lady’s Road. I am sure there is a rat run near you in Greater Belfast. My apologies for the gap in my local knowledge about your area. Soon quiet neighbourhoods are spreading across Belfast. Putting in place a 20mph speed limit will also help to make streets liveable. Sustrans campaign for Safe Routes to Schools, with the aim to make the school journey “safer, healthier and more enjoyable for everyone”. Closing rat runs in my opinion can serve two purposes: taking cars away from residential areas and encouraging parents and children to walk or cycle to school. My vision goes wider: we could use our becalmed streets to make a web of safe routes across our city, linking schools, libraries, local shops, health centres. Reconnect communities, previously driven apart by cars. In London they are called Quietways. And these quiet ways are ideal for cyclists to get around the city. It will be important that neighbourhood residents, schools, local businesses all buy into the vision that stopping cars using rat runs is a good thing. When local businesses are pleading with the DRD to roll back Urban Clearway restrictions in South Belfast business support for traffic calming measures cannot be counted on. Residents will be more easily persuaded, provided they are shown what a difference blocking a rat run has made to a local community elsewhere. They also need to be given ownership of the project, given input. They know their streets and communities best. Perhaps my suggestions above are not suitable or workable, but the local residents might know of a better place to block a road and deter rats. Speedbumps have not worked. Let’s try something different so these rat runs might yet become a short-cut to a people-friendly future. Policy will need to flow in the direction of better traffic ‘management’ if the full benefits of the Comber Greenway / Connswater Greenway are to be realised with a link to a future Gasworks Bridge. This kind of rat running, common to streets around Ravenhill/Cregagh/Castlereagh, must be consigned to history. Another classic rat run is the entrance to Victoria Park, especially during the kids football season, you get cars directed down Park Avenue by a sign on Connsbrook and cars using Connsbrook Drive and using the staggered junction with Kyle St as a chicane. The entrance to the park is a tunnel big enough to take one car and as a result you have much reversing and swearing, add pedestrians, kids with no road sense and cyclists and it all gets rather interesting at times. A rat run is a neighbourhood street consistently used by motorists to avoid busy junctions or congestion on main routes. Orangefield Crescent is such a route, avoiding the Ladas Drive/Castlereagh Rd junction. Some drivers duck into the nearest side street at the merest whiff of a hold-up, but that doesn’t make that side street a rat run.